I wrote sometime ago about still being haunted by Highway 40 out of Baltimore on the first walk. For some it’s like the naked nightmare when you’re in public completely unclothed and exposed or others the one about missing the final exam and failing the semester even years past graduation. Mine is losing my boys. It almost happened on that highway. I’d been given collars to test out for a potential sponsor. Slim sleek with a few bells and whistles I outfitted Hudson and Murphy with them and hoped they’d work but at that critical point – they failed and slipped off within 50 feet of 4 lanes of traffic traveling 60 mph. I had like four heart attacks in the time it took me to secure them. TAGG offers that kind of hope to pet parents and that’s why we’re partnering with them on this walk. 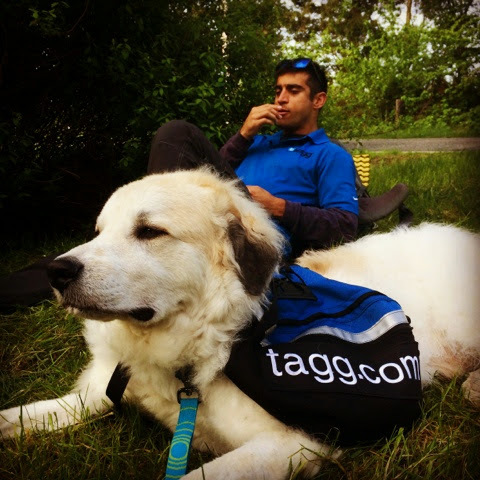 Not only does TAGG have GPS tracking if your dog gets lost but you can also monitor their daily activity and they’re the only company that does that. And while we’re on the road, TAGG plans on having contests for the pups with the most points though expect some stiff competition from the fuzzybutts. We’re averaging around 500 per day! Also the folks there have a promo called TAGG it forward and if you purchase a pet tracker you’ll get 10% off and they’ll donate $25 towards our cause. Sweet. Just enter 2dogs in the promo code. Now that the sites are live, you can track the fuzzybutts as they walk the west coast on the awesome micro site TAGG has built for us at www.2dogsagainstcancer.com. This is my first time using an iPad and I haven’t figured out yet how to hyperlink. Come this May 11th, I’m walking again and if you’ve been reading this blog, you know the route: Canada to Mexico via the West Coast Seaboard. And as we begin making final preparations and training for it, I’ve realized that this is the way to portray the first walk. JAVIER PADILLA CON MARTA CARMONA Y NONO. LA FUERZA DE LAS IDEAS.